Lengthier cuts were used on minimal suits where long lapels were proportionately matched with maxi dresses in shimmering silks. Loose denim tunics came in worn as dresses or paired with front-pleated trousers alongside loose denim box-cut jackets. Flowing dresses in printed chiffon with pleat details or shining silks were slashed at the sides giving an almost Eastern feel easing into a preppier look, where blazer and short combos were worn with woven saddle bags. 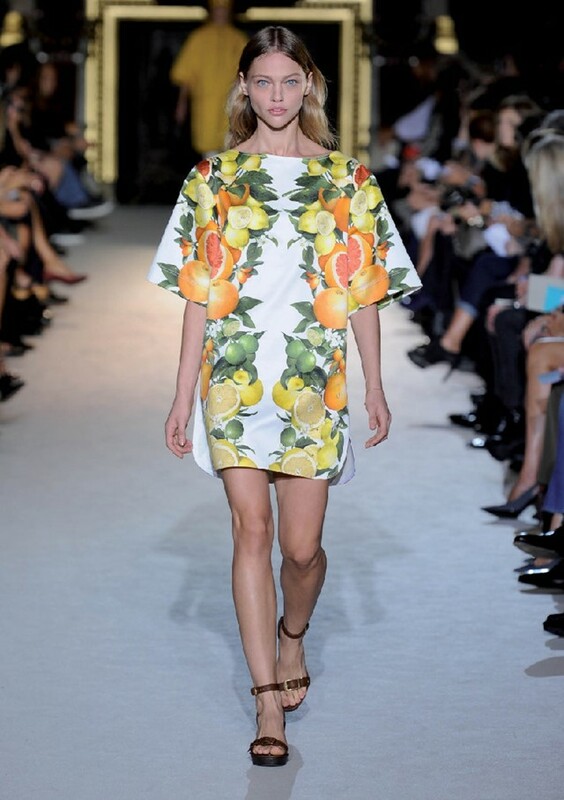 Sasha Pivarova sauntered in with a blast of colour through quirky grapefruit prints reminiscent of warm Italian summers alongside bright yellow raincoats before the citrus patterns continued on shirt lapels and more matching slashed skirts.